Researchers studying Reed warblers have found out that mob rule can avoid being cuckolded by cuckoos. 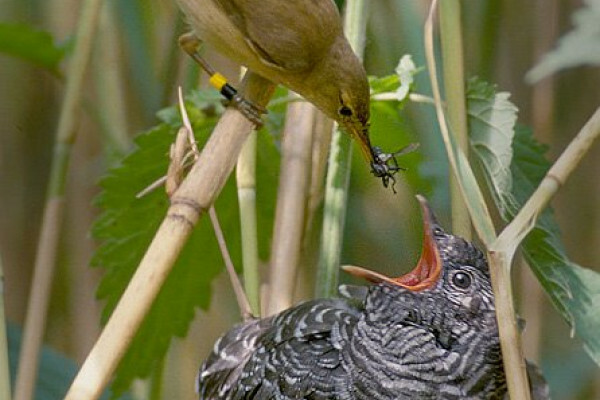 Cuckoos live a parasitic lifestyle - laying eggs in the nest of other birds and letting them spend their time and resources bringing up their young. From an evolutionary perspective, it's a good trick if you can get away with it, but if you're the victim you're wasting your own resources on someone else's DNA. Writing in Current Biology, Cambridge University researcher Nick Davies reports on how Reed Warblers use mobbing techniques to keep the parasitic cuckoos away from their nests. Mobbing is a risky strategy - it's energy intensive and it exposes you to predators, and may not prevent the cuckoo from getting through. Worse still, sometimes they mistakenly mob a sparrowhawk, which looks a bit like a cuckoo and actually prays on reed warblers. Some birds would save their energy, and just reject any eggs that don't look like their own, but the cuckoos have evolved to be able to lay 'mimic' eggs which look similar, establishing an evolutionary arms race between parasite and host. By placing model cuckoos near the reed warbler's egg-bearing nests, Davies and colleagues could observe how the warblers attempted to defend their nests. About half the time, the warblers became aggressive and attempted to mob the cuckoos. In the high risk areas, this made them far less likely to be subject to a cuckoo visit than their more peaceful neighbours. Reed warblers also reserved mobbing behavior only for cuckoos, showing that they adapt their nest defense strategy according to their conditions, not unlike our own military!